Mobile, very high performance model for open-plan offices. Can destroy entire computer listings and shred CDs, credit and store cards (details see below). Practical storage space for paper stacks. Folding safety element, in the security levels 2 and 3 with infeed slot for CDs and floppy disks. Modern electronic controller. Photoelectric cell for automatic start/stop control. Rocker switch for on/off and reverse. Stand-by mode with LED indicator. Stops automatically when the waste container is full and when the door is open. 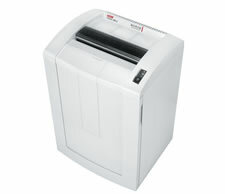 Automatic stop with LED and convenient automatic reverse in the event of a paper jam. Removable, reusable waste bag. Made in Germany.